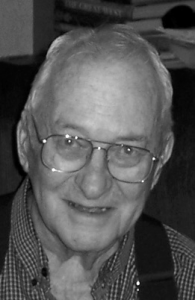 ← Raymond “Ray” E. Eyles Sr.
Darrell Lee Mitchell, 96, of Swanzey died on January 16, 2019, following a long period of failing health. He was born on May 8, 1922, in Berlin, New Hampshire, the son of Elton and Mildred Mitchell. He was a lifelong resident of New Hampshire. As a young man he enlisted in the army and served in the 738th Bombardment Squadron, 454th Bombardment Group of the United States 15th Army Air Force as a mechanic on B-24 Liberator bombers in Cerignola, Italy, during World War II. When the war ended, he enrolled at the University of New Hampshire in Durham, where he received a degree in mechanical engineering. During that period he met and married his wife of 65 years, Priscilla Wood Mitchell. Darrell’s first career position was with General Electric in Somersworth, then in 1955 he moved to Charlestown after securing new employment with Bryant Chucking Grinder in Springfield, Vermont. While working for Bryant he acquired several patents on magnetic memory drums some of the earliest computer memory devices which predated memory disks. In 1960 he made another career move to take a position with Miniature Precision Bearings Corporation, and he moved the family to Swanzey Center. He finished his career with Markem Corporation where he held several management positions including Director of Research, Development, and Engineering. Darrell served many years on the vestry of St. James Episcopal Church, and as a trustee of the Mount Caesar Union Library in Swanzey Center. In his spare time he enjoyed home improvement projects, gardening, reading, hunting, and especially fishing for brook trout with his father in the Great North Woods. He also enjoyed occasional horseback riding. He is survived by a son, Robert Mitchell and his wife Kim, by a daughter, Susan Newell and her husband Ralph (Whip), a granddaughter, Leah Cox and her husband Jay, a grandson, Michael Mitchell and his wife Ashley, five great-grandchildren, three sisters-in-law, two brothers-in-law and their spouses, and numerous nieces and nephews of multiple generations. He was predeceased by his wife, a younger brother and nephew.